Yep, it’s “doing things that make it worse” week. Looks like “Making It Worse” Week, but that might as well be Biff Week. When I can’t sleep, I don’t count anything specific, I just count as high as I can… in Japanese. And that’s how biff has hired as orange counter. Biff wasn’t sure what the point of the job was or if orange counter was a fitting name. But biff was glad he got paid for a job where he can eat to make things go faster. My partner is like that, he can sleep anywhere anytime. I’ve seen him fall asleep typing on his keyboard. He’s proud of the fact that he could fall asleep while writing on the blackboard during high school, crazy. Tired? I just don’t focus on anything anymore. Gloating aside, I’m quite enjoying this week’s theme. I’m amazed that after 500 comics, Chris is still keeping it fresh and original. Keep it up, man! I wish I could sleep that well. 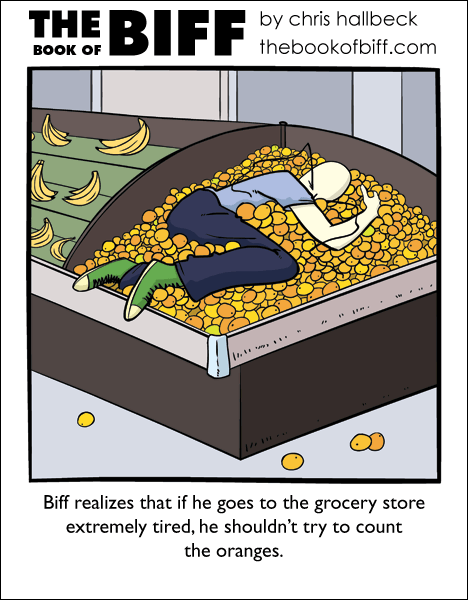 Did biff actually climb into the the oranges, and then go to sleep? I doubt you could fall asleep in that position involuntarily. I bet the position Biff’s in is because we stretched over the counter to count the oranges in the back. Just found this comic today and already read them all from the start. It’s like when you put your whole hand in those barrels of seeds, and wish there was a giant tub of them you could crawl into. This is completely normal. @Bob – Thanks for reading! Waaaaaaaaaaaaaaaay down the list, but still in response to LazerWulf, the numbers you used are what you say when you are counting something. Why not just count the numbers themselves? With Ichi, Ni, San, Shi, Go, Roku, Shichi, Hachi, Kyu, Jyu. Man, those oranges are worse than sheep. Odd… My Avatar thing didn’t work…..
Yours does, but mine does not. Odd. He really is just soooooo adorable in this one. I have no choice. I now forever have to think of Biff as some kind of tiny, voiceless, subhuman pet I keep in a little glass case. Biff is INVINCIBLE. He gets cut in half, burned, invents fantastical devices all day. Then you see something like this and he’s so exhausted that he falls asleep curled up in a pile of oranges. It’s like human vulnerability all packaged up in a little frame for me to look at on my monitor. I’ve officially overanalyzed and romanticized Biff. I guess that probably means I need to get out more. Starseedjenny…I really hope your female, otherwise i’d be very creeped out. Even still, I’m a bit creeped out though. Also, there a green orange in there? yeah, yeah, I’m a girl. I’m not usually this weird, pinky promise. I don’t know what’s wrong with me today. Jeez, when I go to bed I end up thinking of how I could’ve done things differently and then think about different possible plot lines and events for my stories, so it takes me forever to sleep, but biff can even sleep at the store! I see four greens, not just one. @fwtrump (& everyone who doesn’t have a gravatar) – apparently it takes a little while for the gravatars to work after you’ve posted them. oh and i can fall asleep just about anywhere if i really want to. i’ve slept in a gravel parking lot before. and in the bed of a pick up truck. And of course immediately after I claim there are four I find an additional green! Five! Five green oranges! Ah-ah-ah-ah! Almost as fun as counting graham crackers! I’m not good at fine detail repetitive tasks – It looks like Biff lasted longer than I would’ve. when I’m really sleepy at work. The serial numbers on people’s accounts starts to look like words and I try to read them…. I can’t get my picture to show up. Do I need to post under my Gravatar account name? That looks comfortable. And hey, you get frsh-squeezed orange juice when you wake up! Biff often swims in orange juice, even sleeps in it sometimes I recall. That must be superbly comforting for him. I can’t watch anime when I’m getting tired. Especially if there is a long storyline attached to it. So I watch Powerpuff Girls. Biff looks adorable curled up in the oranges. haha, that looks REALLY COMFY! at least it wasnt the bananas…?